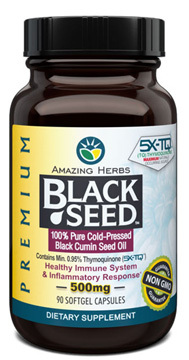 Black Seed Oil Softgels - 500 mg, 90 softgels (Amazing Herbs) - Penn Herb Co. Ltd.
Amazing Herbs premium Black Cumin Seed Oil is a rich source of EFAs (essential fatty acids) and antioxidants, and offers a promising alternative remedy to help combat age-related disorders and restore a youthful and optimum inflammatory balance and immune system response. AMOUNT PER SERVING (2 CAPSULES): Black Cumin seed Oil Unrefined, Cold-Pressed, Virgin Nigella sativa Seed Oil; Omega 3 0.25%, Omega-6 57%, Omega-9 22%. OTHER INGREDIENT: Gelatin (Bovine, Halal), Glycerin (Vegetable Kosher), Purified Water. Alcohol Free. Solvent Free. 100% Purity Guaranteed. NON-GMO. Naturally Gluten Free. Halal. Healthy immune system and inflammatory response. The softgel capsules provide a convenient way to take a consistent amount of Black Seed oil without the distinctive taste of the oil. As a dietary supplement for adults, take 2 capsules twice daily. May take as many as 10 capsules per day.